RJ Sangosti, The Denver Post. In case you missed it, the Denver Post recently featured two Denver Croquet Club members (Ron Eccles and James Creasey) playing croquet on the ice of Evergreen Lake! In the winter, Evergreen Lakes turns into the largest Zambonied outdoor ice surface in the world. 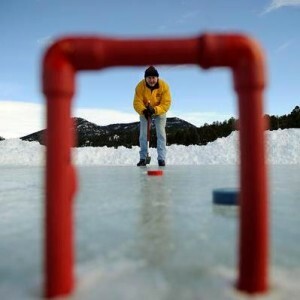 Ron and James used specially designed ice croquet "pucks". Check out the full article in the Denver Post!